Place your orders with Mike Benford-Miller for the Mellor Calendar 2014 in support of St Thomas’ Church and Rose Queen Rebecca’s charity “The Children’s Society”. There are order forms in the Parish Centre or telephone Mike on 0161 427 4311. The calendar will be available for sale in a few days and has 12 of the paintings of Mellor that Mike exhibited earlier this year. We are in that pregnant pause between the submission of our bid to The Heritage Lottery Fund and the panel’s decision. The project has been running, on limited resources, for two years and we have built up a ‘head of steam’ that we don’t want to lose. Our volunteers have been stoical in their toils to identify all the buildings and features at the Mellor Mill site in order for a definitive survey to be carried out as part of the HLF Stage 2 submission. The survey completed and our bid safely deposited with HLF we were determined that we would carry on with the excavations as if the HLF award had been made. At the end of July we found ourselves starting to excavate at the northern extremity of the main Mill complex. This is the boiler house and the steam engine house. A building, constructed in 1860, which is detached from the main Mill, housed the Lancashire Boiler and two horizontal steam engines, manufactured by Goodfellows of Hyde. We started to investigate the depression where the building once stood but now was only showing the top few inches of the long engine holding down bolts above the debris and dense undergrowth. Early on we uncovered what, at first, was thought to be the boiler flue but this seemed to be in the wrong location. The latest interpretation is that it is an economiser providing pre-heated water to the boilers to save on fuel. In 1877 we find the original steam engines put up for sale and the following is the sale notice from the Manchester Guardian. One Pair of Compound Horizontal Steam Engines by Goodfellow, of Hyde; high-pressure cylinder 14in. diameter, 4ft stroke. 2½in piston rod, cast iron slides, 9ft. connecting rod and strong cast-iron bed complete; low pressure cylinder 27in. diameter, 2ft.6in. stroke, 3½in. piston rod and connecting rod; horizontal air pump in front of low-pressure cylinder and on same piston rod, cylinder and air pump on cast-iron bed, complete; crank shaft, 6in. necks and 7ft centres of engines; spur wheel, 60 cogs, 3in. pitch, 8¼in. wide; flywheel, 12ft.3in. diameter; rim, 8in. wide by 9in. deep. Can be seen at Bottoms Mill, Mellor, Marple. From measurements taken from the holding down bolts, protruding through the ashlar engine mounting blocks, it has been calculated that the original pair of engines were replaced with a much more powerful pair in 1877. Possibly capable of producing 120 hp which is equivalent in power to the three mill water wheels. Was this a last ditch attempt to keep up with the steam powered mills in Stockport, Manchester and beyond? The new engines were powered by not one but two Lancashire Boilers with the second one housed in an extension to the north of the boiler house with extensive alterations to the coal cellars taking place at the same time. During the excavations there have been a number of significant finds. We have recovered several pieces of ‘fire bar’ from the boiler house and from the engine fly wheel pit a tapered key which was possibly to join a connecting rod to a piston. 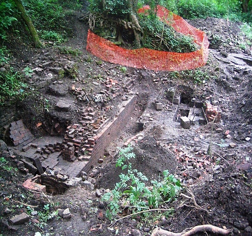 A group of Scouts from Warrington, working towards their Heritage Badge, and later ‘A’ level Archaeology students from Aquinas College, in Stockport, have uncovered a substantial section of the flue which ran up the hillside from the boiler house. 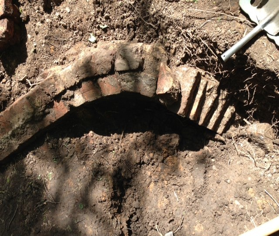 Section of the brick arched flue. in the engine house with the holding down bolts for the engines to either side. We are sure that there has to be a drainage system from the boiler house to allow for the boilers being drained down for maintenance. To date we have failed to find its exact location and so during inclement weather we suffer from a build up of water at the bottom of the dig. The building has been difficult, at times, to interpret due to the major alterations and extensions which took place when the engines and boilers were upgraded and we will need to give careful consideration to which features to present for public viewing. Of major concern is the conservation of the exposed masonry and its protection from the elements in the future. The English Heritage, Heritage at Risk team, will be advising us on the best way forward to ensure this important piece of our Industrial Heritage is presented and protected for all to enjoy into the future. Weather permitting, work will carry on through the winter. Visitors and Volunteers are always welcome. We have tour guides available both for the casual visitor and, by arrangement, for organized groups. The long wait was over for those working behind the scenes to create the Mellor Mill Heritage Day, at the Roman Lakes. Weather forecasts had been watched as the day drew near, early in the week Sunday was predicted to be wet and windy, clouds of despair began to grow, but lifted as the day approached, and fine weather was forecast. Volunteers scanned their print-offs, when would they be needed and where? Various jobs had to be done, pop-up museum, face painting, finds washing, beer tent, bricks and nails stall and more. Gazebos erected, fingers fiddled with fittings, tables filled, chairs found and sat upon. At last the sun shone through the clouds and the show was off to a fine start. Down either of the two hills, which descend from Marple and Marple Bridge, the visitors came, to encounter, first, the Booking Office. Under the green awning tickets, for entry to the site by programme, were available for the extensive tours of the Mill site. Nine tours in all, in three sets of three, these starting at 11.30am, 1.30pm, and 3.30pm. Then from the mill site, a walk, to the hub of operations for the day, Roman Lakes or Mill Pond 1(pre 1892), which became a hive of activity during the day. Though business started at a trickle, by noon the stream of visitors was in full flow. 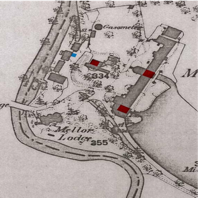 By which time Samuel Oldknow himself was guiding one of the tours round the site of his former mill. Fortunately the ground was not too wet; the penalty of muddy shoes was not too severe. Many questions, during the tours, interest in the project grew as the parties were led round. This serves as an indication of the invaluable work that has been carried out by the team in opening up the area to reveal some of our local history. Mellor Mill Heritage Day, a splendid, memorable occasion when the memory of Samuel Oldknow, his groundbreaking mill, and the mill hands was celebrated. The final accounting for Mary Hoult’s Gold Medal winning garden is nearly complete and a cheque for £8000 plus will soon be presented to Cancer Research UK. The money was raised through a daily raffle, collections and plant sales. The garden was well received by all the Tatton visitors with many people saying how much they liked the calm and reflective nature of the Networks Garden. The Charity was delighted to have a presence at Tatton and used the garden for award ceremonies. Also local groups of fundraisers were invited into the garden for special guided tours by Mary as a thank you for all their efforts. Thank you to all volunteers – the planters, raffle tickets sellers and those that stood in the blazing sun for many hours explaining the garden design and planting scheme. Thank you also to all who took part in the plant sale outside the Devonshire Arms and to Darren and Louise for the use of the pub garden. This a list of some of the events and entertainments happening in Mellor during Christmas and New Year. In case of late changes it would be worth checking the web sites of the various organisations. Tuesday 31st December New Year seven course meal followed by fireworks at midnight. Tuesday 17th December The Mellor March Lantern Walk in aid of cancer charities. Best Wishes for Christmas and the New Year from The Mellor Society Committee.